Pictured Rocks National Lakeshore, photo by onewildwest. 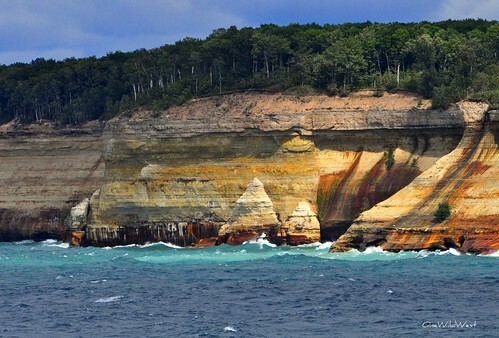 The name “pictured rocks” comes from the streaks of mineral stain that decorate the face of the sculpted cliffs. The ramparts of the cliffs are composed of 500-million-year-old Cambrian sandstone of the Munising Formation. The Munising Formation makes up much of the angled slopes and formations, such as Miners Castle. Closest to lake level is the Jacobsville Formation, a late-Precambrian mottled red sandstone that is the oldest exposed rock in the park. Covering all is the 400-million-year-old Ordovician Au Train Formation, a harder, limy sandstone that serves as a capstone and protects the underlying sandstone from rapid erosion. The streaks on the cliffs occur when groundwater oozes out of cracks. The dripping water contains iron, manganese, limonite, copper, and other minerals that leave behind a colorful stain as water trickles down the cliff face. Check it out bigger in Brent’s slideshow. More Pictured Rocks from Michigan in Pictures!